America has always been the top destination for immigrants wishing to start new businesses - according to research from the Center for American Entrepreneurship 216 of the companies on the Fortune 500 (43 percent) were founded by immigrants or the children of immigrants. This includes household names such as Apple, Google, Netflix, Tesla, Pfizer, Procter & Gamble, and many others. If you are a foreign national wishing to emigrate to America to open a business, this guide for immigrant entrepreneurs will help get you started. Immigrants tend to make up a high percentage of main street business owners. For example, 61 percent of gas station owners are immigrants, as are 58 percent of dry cleaners owners, 45 percent of nail salon owners, and 38 percent of restaurant owners. The employer must first file Form I-129 (Petition for Non-immigrant Worker) with U.S. Citizenship and Immigration Services (USCIS). The form cannot be filed by the employee. Once the approval is granted and the application fees are paid, the employee continues the process by filing Form DS-160 online. The applicant must also have an interview at the U.S. Embassy they are applying from. For more information on the L-1 visa program see the U.S. Citizenship and Immigration Services website. E-2 visas are only available to eligible countries that have treaties with the U.S. (list here). Note that countries such as China, Russia, and India do not currently have E-2 treaties with the U.S. The length of for which an E-2 visa is valid varies, depending on the reciprocity agreement between the country of origin and the U.S. Some countries allow E-2 visas for periods of up to five years, others a maximum of 3 months. Regardless of the how long the visa is valid for, applicants are allowed a maximum stay of two years, which can be renewed for two more years by leaving and re-entering the country. Note that if the visa expires during the two year period the applicant can continue to stay in the U.S. till the end of the two year period. If the holder does not plan to leave the country they can apply for a change of status and be granted another two year stay even with an expired visa. However, if the holder leaves the country he/she will need to re-apply at a foreign consulate for a new E-2 visa to re-enter the U.S. The E-2 visa does not provide a direct path to residency (green card), however if the business grows into a larger enterprise the applicant can change their visa status to EB-5, which does confer residency status. E-2 visa holders may also be eligible for marriage or family based green card applications. The EB-5 visa is ideal for wealthy immigrants who are willing to invest a substantial amount of capital in a new or existing business in the U.S. In return the investor and his/her immediate family are eligible for permanent residency status. The main purpose of the program is job creation. From 1990 - 2015 foreign investors from China, Canada and the Middle East created thousands of American jobs through the EB-5 program by investing more than $6.8 billion in American businesses. In return more than 29,000 U.S. Visas were awarded. Up to 10,000 EB-5 visas are granted annually, with a per country cap of seven per cent. China, Vietnam, and India are the most common applicants. Applicants must demonstrate that the investment funds or capital comes from a legitimate source, i.e. not illegally obtained. Evidence required includes banking records, business and/or personal tax returns, etc. Applying for an EB-5 visa is a complex process that requires numerous supporting documents - most applicants consult an experienced immigration attorney to help guide them through the process. EB-5 visas typically require at least a year for conditional residency and two years for a green card, although investors from some countries such as China have had the EB-5 process take longer to complete. H-1B Visas are issued to immigrants on an as needed, temporary basis to fill vacant job positions with employers in the U.S., particularly in industries such as high tech. An H-1B visa holder can start a business in the U.S. as an investor, however they cannot work for the business––only for the employer who sponsored the visa. EB-5 Visa - Numerous accusations of fraud and abuse have been leveled at the EB-5 program in the past, raising debate among lawmakers and lobbyists. Possible upcoming changes include raising the minimum investment required and/or increased scrutiny against fraudulent applications. H-1B Visa - The executive order calls for better screening of immigrants to crack down on potential abuses in the H1-B system. In response, Silicon Valley giants such as Apple and Google are pushing back and asking for increases in the current H-1B cap. L-1 Visa - The criteria for eligibility for L-1 visas has been tightened, particularly with renewal applications. Being previously granted an L-1 visa no longer increases the chances of extension - each renewal application is now treated as an entirely new petition. 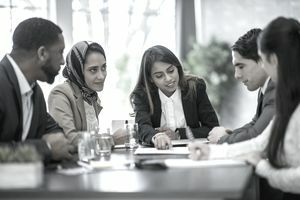 Eliminate the per-country caps for employment-based immigrant visas, which hinder U.S. employers from recruiting the top-tier talent they need to grow."